Single girder EOT crane is designed and built to serve your infrequent, light duty and moderate lifting needs with capacity not more than 20 tons. 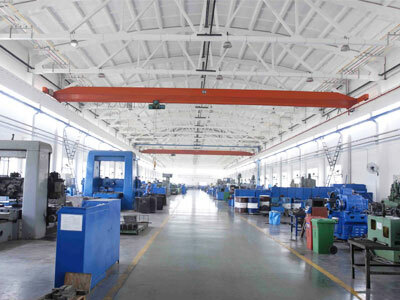 The single girder travelling crane can be widely applied in machine shop, warehouse, repair shop and storage yard to fulfill different requirements. Depending on the type and weight of load to be handled, environmental conditions and duty cycle, we will design the perfect lifting solution for your business. 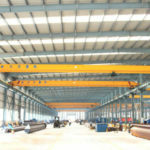 The single girder EOT overhead crane produced by DAFANG heavy machinery is available in multiple types for your choice. Whatever your applications, you can find one that perfectly fits your needs. 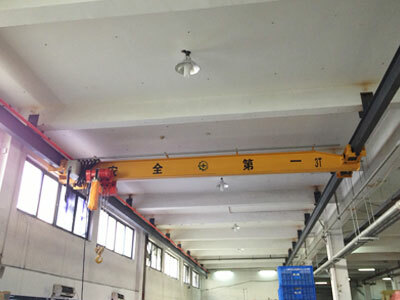 According to the way it runs, it can be divided into top running crane and underhung crane. 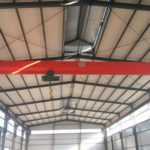 Top running overhead crane – it is mounted on building columns or specifically engineered columns, which can lift more tons than the underhung bridge crane. 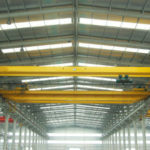 The top running single girder EOT crane is the most common type used in a variety of fields, and it features low headroom, high working efficiency and little maintenance. Under running crane – it is built with standard capacity up to 10 tons. 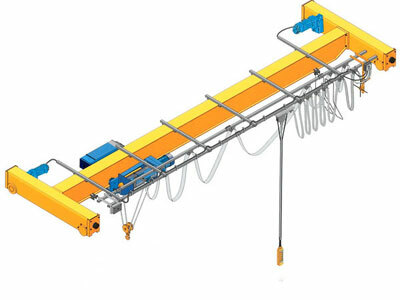 Hung from existing building roof structure, the crane offers minimum trolley approach dimensions so that it can improve the utilization of the building space. The weak point of this particular crane is that the hook height will be reduced due to the position of runway rails. 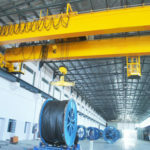 Other overhead crane models we supply include LD type single girder EOT crane, HD type single girder EOT crane, grab crane, explosion proof crane, foundry crane and magnetic overhead crane. The typical and customized configurations are available to meet almost all needs of customers. 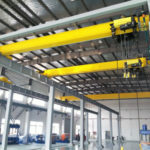 The difference between single and double girder EOT crane falls in girder construction, carrying capacity, working efficiency, lifting speed and so on. In general, the single beam crane is built with one single bridge girder that can lift up to 20 tons. It has relatively low lifting speed and working efficiency. The double girder crane, however, is built with double beams so that it is capable of handling more weight, usually going up to 300 tons. 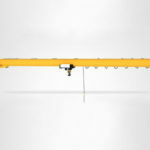 The double beam overhead crane offers higher efficiency and greater lifting speed than the single girder bridge crane. 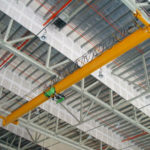 Though built with one single girder, this overhead travelling crane is equally rigid with double girder crane. They can both serve you for decades with excellent performance. We have specialized in EOT crane design and manufacturing for over 10 years. 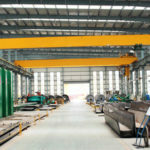 We can provide high level overhead crane design with respect to strength, safety, reliability and durability. If you are looking for a single girder EOT crane, Dafang heavy machinery can be your best choice!